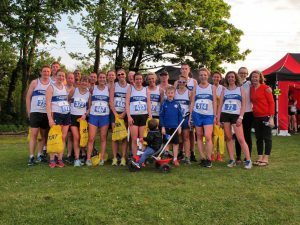 The Summer League is now in full swing with the 4th event and 2nd of the Babcock 10k Series – Dumbarton 10k on 11th May. This popular event is a fast, flat course, with lots of PB potential and this year it doubled as our Club 10k Championships. 28 Harriers raced on the day, with Mary Senior and David Lindsay taking the aforementioned 10k Club Champs. Congratulations! Mary also won 3rd FV40 and David was 2nd MV40. Paul O’Brien joined the Vets on the podium winning 3rd MV60. Whilst we await confirmation of team prizes, it looks like we may have won 2nd place Ladies team with Mary Senior, Emma Blair and Anne Sillars. What a good evening out for Garscube!